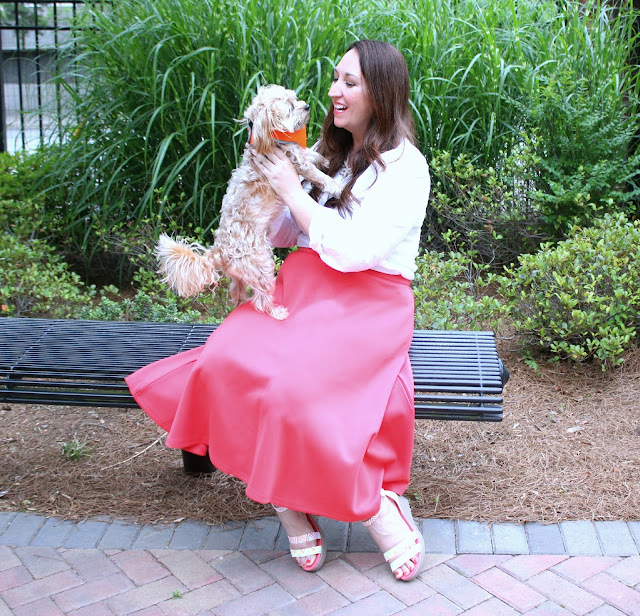 Elle Sees|| Beauty Blogger in Atlanta: Sunshine And New Shoes! Hey you! How's the weather where you are? Have you been able to get out and enjoy the sun much? I have been enjoying the weather like crazy lately. Finally some sunshine in Atlanta after a grey winter. Any chance I get to be outdoors, I am taking it, especially if I have my pup Charlie with me. He is very social and loves being around people. Take for example when these pics were taken--we had just gotten back from a fancy brunch with friends. Sometimes it's just what the doctor ordered, am I right? It was just the perfect outing after the rough past couple of months I've had. It was time for some joy and fun! And that brings me to my shoes! Now to get to the brunch was quite a hike through the local park. I wanted something cute, comfortable, and fun to wear. I went with a coral midi skirt, a classic white button up, a chunky but elegant necklace, and my Leigh Graphic Wedges from Crocs. Not only are they super fun, but they are so comfortable, y'all. Yes! Let me repeat that: wedges can be comfortable. You need these! These are the multi-color ones but they also have a mushroom shade as well. These shoes are just one of the many offerings of new Crocs Spring-Summer 2015 Collection. Charlie is making me laugh because he just sneezed. It was cute, as is everything he does. Almost. ;) Love this cutie! He was so good at the brunch and kept trying to give everyone "puppy eyes" to try to charm everyone out of their food! I love the print and the cute colors on these. While I wore mine to brunch, these shoes can be worn in a variety of ways. They go perfectly with any style. Think jeans, shirt, and blazer to dress them up. I've also worn these with white jeans and a cute coral tee. For spring and summer, try shorts and a tank or a fun summer dress. Charlie and I think you need a pair or two! Find the Leigh Graphic Wedges HERE or visit Crocs.com to see the entire Spring-Summer 2015 line. How will you find your fun in your Crocs? PS: I've got 2 fun giveaways, so click here AND here. These wedges are so, so cute!! I would never guess they are from crocs! I love how you styled them with that fabulous skirt! You and Charlie look adorable! Wow! Crocs are really stepping up their shoe game. These are too cute! Ooooh, I love seeing an outfit shot from you (and I'm a fan of the wedges, they look great!). Those shoes are so cute and elegant.. I loved ur outfit as well.. Pretty !! I can't believe those are Crocs! They are too cute! So are you and Charlie! Love that skirt! I can't believe those are Crocs - they're adorbs! I am so loving the print. And Charlie! Swoon! I just want to cuddle him!! Wow, I had no idea those were crocs! Super cute! Those are so cute! Love the picture of Charlie with them at the end! Wedges are definitely very comfortable, you are right! I love the picture with Charlie so cute! You look beautiful, this skirt is really great! And so are the shoes, I really loved them, they look stylish and very comfortable! I love crocs. I have two pairs that look like ballerina flats and there is no way you would know that they were crocs. I wear them all the time and always get compliments on them. They are so comfortable. I cannot believe those shoes are crocs, they are sooooooo cute! And love your skirt too, lady! Loving your shoes and skirt! Great combo! I never knew Crocs made anything like this. So cute, but you and your outfit make them even cuter!! Cute wedges. The skirt is special, too. You're looking ready for Summer! Such cute wedges and so glad to hear they're comfy. We seriously can't believe they're crocs though. So cute!! Super cute! I would have never guessed they were crocs!!! I'm glad you guys are having nice weather!! Ours has been nice one day, cold and rainy the next! I actually just got a pair of Croc flip flops. They're amazingly comfortable and not too badly priced! They needed ZERO breaking in, and they look pretty cute too. I like how durable they feel as well. I'm impressed - they're my first pair by the brand. I know people give Crocs a bad wrap but they have some really cute stuff! I love that kind of wedge - height added, but still comfy. Crocs are amazing shoe. I have own some in the past. I'm loving your outfit. Love Charlies cameo in this post lol. Those wedges are fun and perfect for the warm weather! Those don't look like crocs!! So cute, and I love the skirt you are wearing! Look at you doing a style post lady, I love it!! These are so unbelievably cute, and I'm glad they're comfy too. Pretty impressed, crocs! Cute outfit and Charlie is just the cutest! They are really cute! I love your outfit. I love all your posts, but posts with lots of pics of Charlie might be my favorite! He's too cute and so is your outfit. Love the skirt! Those shoes are fun and yay for comfort! And OMG Charlie!!!! He is too stinking cute!!! I wish I still lived in Atlanta, we could have gotten together with our little doggies for a doggie blate! Mac and him would be great friends :) Have a great week! Aw, Charlie is so precious! I wish I could take my Paisley out more! She gets car sick so that complicates things. Love your look, Elle! Fabulous coral midi skirt! And wow, those sandals are cute. Can't believe they're crocs! 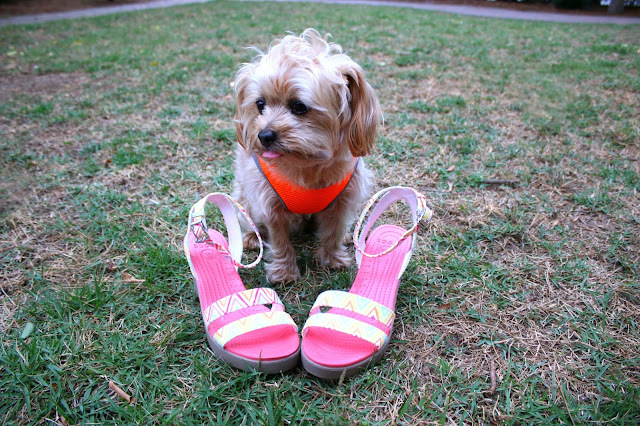 Those Croc wedges are really cute (as is Charlie). I have a pair of Croc slippers that I've been wearing for ages, they probably need to be replaced. And you look so lovely and beautiful, sweetie. Continue enjoying the sun! I would have never thought those were Crocs! So cute and fun for summer! First of all, Charlie is just precious! The wedges are so cute! I didn't know Crocs were making wedges now. They sound so comfortable! Congrats on your first fashion posts! I am thinking of doing my first beauty post soon so we will be flip flipping!! Love it all! 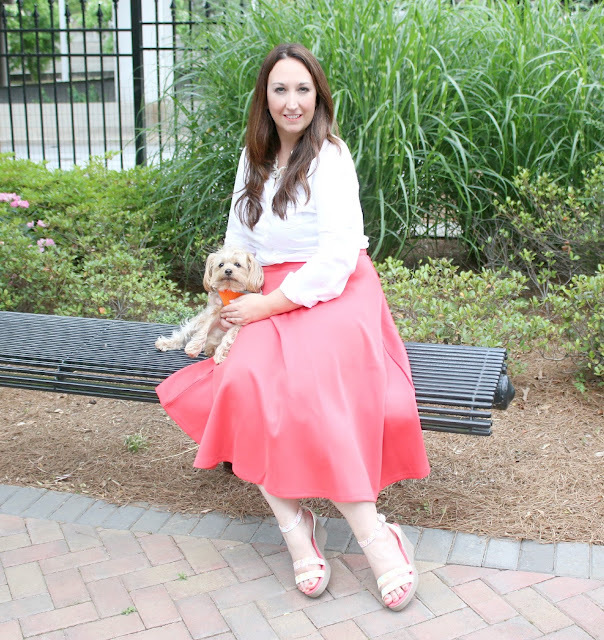 That skirt, those shoes, you, and that sweet pup...all SUPER adorable! You two are seriously the cutest!! Charlie's vest - I'm dying! These wedges are perfect - the coloring would go with so many outfits! These pictures are so sweet, and I love the wedges! The skirt is such a gorgeous color and the wedges are perfect with it! I love wedges...they give you some height, but are still comfortable. And Charlie? Can't take the cuteness! I can't believe these are crocs! I must have a pair of these! I would rock these this summer on the boardwalk. I had no idea these were crocs! Cute skirt! Absolutely love them! Way to go Crocs! Steppin it up! I would have never guessed those wedges were from Crocs! They are super cute! Love the pattern! Charlie is looking adorable too! Can't believe these are crocs!! They are so cute and look super comfortable! I'm digging those crocs :) Who would have thought? Those are the first Crocs Ive ever seen that Id actually want to wear! Elle- You and Charlie look fabulous! The sandals are cute. I didn't know Crocs had some hip wedges like that:) thanks! Wow, Crocs have come along way. These are super cute and I'm sure they're super comfortable! Love how bright your look is and your dog is adorable!! such a cute pup!! also - i cannot BELIEVE those are crocs. they have come so far!! 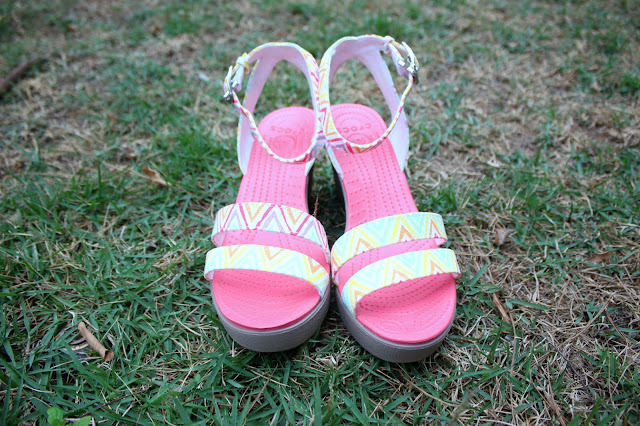 love the bright colors and print on your wedges!